Five finalists have been named for the inaugural Connected Vehicle Challenge, which was developed and is organized by SAE International’s Vehicle IoT Committee. The goal of the Connected Vehicle Challenge is to provide a platform for innovators to engage with automakers and suppliers and work collaboratively to advance the state of the industry. - Joe Barkai, Chariman, SAE International Vehicle IoT Committee. The five finalists, selected from dozens of submissions, will present their innovation in front of celebrity judges at SAE International’s WCX World Congress Experience in the Connect2Car Ballroom on Thursday, April 12, at Cobo Center in Detroit. The winning innovation will be awarded a cash prize of $10,000. Second and third place winners will receive $5,000 and $3,000, respectively. The goal of the Challenge is to create opportunities for innovators, hackers and entrepreneurs to showcase new technologies and disruptive ideas in front of automotive professionals during Connect2Car. Contestants submitted ideas to build and demonstrate an innovative connected-vehicle device, system, or application that demonstrates how vehicle connectivity can contribute to improving mobility, safety, quality of life of individuals and communities, and the environment. “The automotive industry is experiencing an unprecedented wave of technology and business innovation, much of it is fueled by companies and individuals outside the traditional auto industry. The goal of the Connected Vehicle Challenge is to provide a platform for innovators to engage with automakers and suppliers and work collaboratively to advance the state of the industry,” said Joe Barkai, Chariman, SAE International Vehicle IoT Committee. 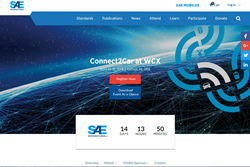 CLICK HERE to learn more about the Connected Vehicle Challenge and Connect2Car at WCX. Journalists and members of the media can register for Press credentials by visiting http://wcx18.org/register/.